On Sweet Briar’s idyllic campus, everything — and everyone — you need is in close proximity. That means good friends and great support are never far away. It’s just one advantage of a small campus where mutual trust and support are the norm. Women from varied backgrounds live on our historic campus for all four years. Living on campus means forging lifelong connections and ample faculty and staff interaction. Here, everybody looks out for one another. 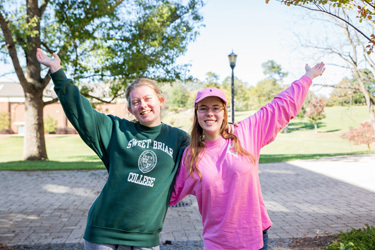 Residence life at Sweet Briar creates and nurtures residential communities. Meaningful programs, workshops and activities in the residence halls enhance connections across campus. Living in the residence halls, resident advisors and resident coordinators are there to provide academic and emotional support — or just to talk. More than half of our faculty and staff live on campus in individual houses and apartments. They are part of our students’ community and serve as resources, mentors and friends. Students live in seven traditional residence halls, as well as a modern apartment complex. Students across classes are housed together to promote community and class bonding.